This weekend we drove a very long distance in a supreme act of indulgence. 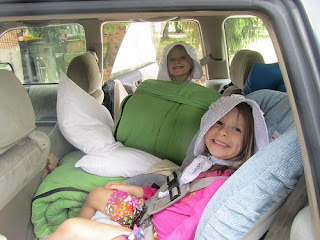 We went all the way to the town of Pepin on the Mississippi River, and back again, all because someone just had to attend the Laura Ingalls Wilder Days festival in Laura's birthplace of Pepin, Wisconsin. And if we didn't go, there would have been a major tantrum. The girls kind of wanted to go, too. Toth got to stay at Grammy and Grampy's, which was more than fine with him. 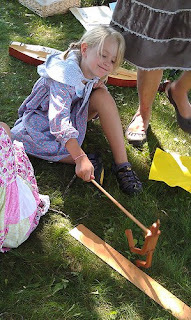 The festival featured some old timey children's games, like the one Nutmeg is playing in the picture, and some people demonstrating 19th century crafts and occupations. One demo that especially captivated Pebbles was the spinning wheel. She got to see just a little spinning, and then the spinner took a dinner break so we went to our campsite and had our own dinner. But afterwards, Pebbles grabbed my arm and hauled me back to that spinning wheel. The whole family watched for awhile, and the spinning lady entertained us by explaining how her hobby saved her money by allowing herself to make high-end yarn for free when friends give her the raw materials like angora rabbit hair. Then for some reason I made a comment about global warming. "Oh," the lady said. "Do you believe in global warming?" Nutmeg spoke up that she did. The lady assured her that "they" have by now learned that it's all part of the earth's natural cycle of warming and cooling, and nothing to worry about. An awkward silence ensued, before we were able to resume chatting about spinning yarn. Later, our friend complimented Nutmeg on her restraint in not arguing with the nice old lady about global warming. I suspected that this was not restraint at work, so I questioned Nutmeg about it. "I was so relieved to find out that global warming isn't happening after all!" Nutmeg said. Was it wrong of me to set her straight? I hate to think of her little 7-year-old brain stressing about global warming, but after all this is her future world it's happening to and I don't want her to grow up with her head in the sand either. Anyway, we had already saved the kids from exposure from disturbing fact that we were having this conversation on the 10-year anniversary of a fatal attack on American soil. I'm glad to say that they were not around a single television on Sept. 11, and on the car ride home we changed the station whenever talk turned to remembering the tragedy. The girls are only 7 and 4 -- they have plenty of time to learn about things like that. Looking back at the past decade, for me, brings into sharp focus how much personal lives can diverge from the broad sweep of history. It's like when you ask someone what it was like to live during World War II or the Vietnam War, and what they remember is that their mother was very sick or that they fell in love and got married. terrible decade, nationwise, one that began in my mind not so much with the awful tragedy of 9/11 but with on Dec. 12, 2000, when the Supreme Court handed the presidency to George Bush. Funny that we -- at least Democrats -- don't commemorate that day and wonder what the 2000s might have been. And yet, for Epu and I, the past 10 years have been the best of our lives. If I could turn back the clock 10 years and a few days, I'd live in a world that could not imagine an act like the terrorist attacks of Sept. 11. It would also be a world where I am still young enough to get carded in bars and have the free time to go out and do that, incidentally. Yeah, and a world without Nutmeg, Pebbles and Toth in it. Life is not fair. I know that thousands of families would do anything to turn back the clock, and my heart goes out to them. For us, erasing the past 10 years would be unthinkable. I couldn't tell the kids why I was doing it, but I could gather them up in a hug on 9/11, and feel in my arms how lucky we are. So well said. Made me cry, of course.